@Tsu: Yes, indeed it is. A sad situation. Beautiful old photo, isn’t that river now covered by the expressway? Boats are docked at the fish market in Tokyo’s Nihonbashi district. If you’d ask someone in Tokyo about this spot now, they will most probably call it a staid business area. This is where the Bank of Japan and the Tokyo Stock Exchange are located. Many financial companies have their headquarters here. Even the department stores in this area—Mitsukoshi and Takashimaya—are seen as a bit conservative. 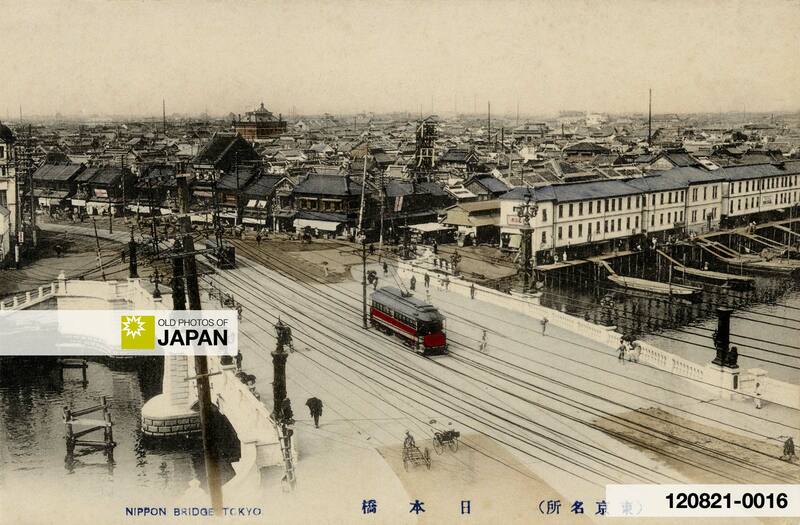 120821-0016 – A streetcar crosses Nihonbashi bridge, the white buildings on the right constitute the fish-market, ca 1910s. Some of the fish, dried and salted, was distributed as far as Manchuria and the distant interior of China. But most of the supplies fed the inhabitants of Tokyo, or Edo as it was called until 1868. A good deal of it was fresh. No mean accomplishment at a time when transportation took place on foot, horseback or by boat. Horse drawn carriages were unknown, and even oxcarts were rare. Japanese roads weren’t ready for wheeled transport until well into the 20th century. Keeping the fish fresh was a challenge. Some routes required constant transferring from boats to horses and back. Sailors transporting fish eventually learnt to preserve premium merchandise by equipping their boats with saltwater tanks. Vendors used tubs or barrels. This custom survives to this day, now using trucks with water tanks and shops with glass aquariums. 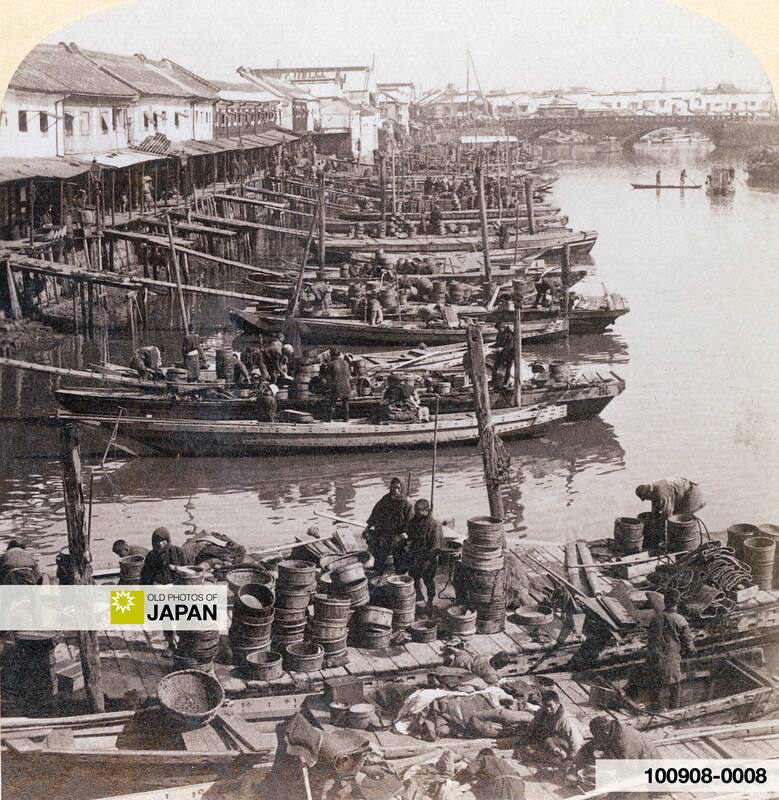 Men carrying large baskets unloaded the fish from boats docked at the back of the fish market. Vendors carried part of this to shops all over town, while buyers of restaurants and the many huge estates of regional lords purchased large amounts themselves. Then there were the salesmen who peddled fish in tubs suspended on a long shoulder balanced pole, called a tenbinbo. They announced themselves in a loud sing-song voice. A housewife was able recognize the voice of her favorite salesman and be out before he reached her door. 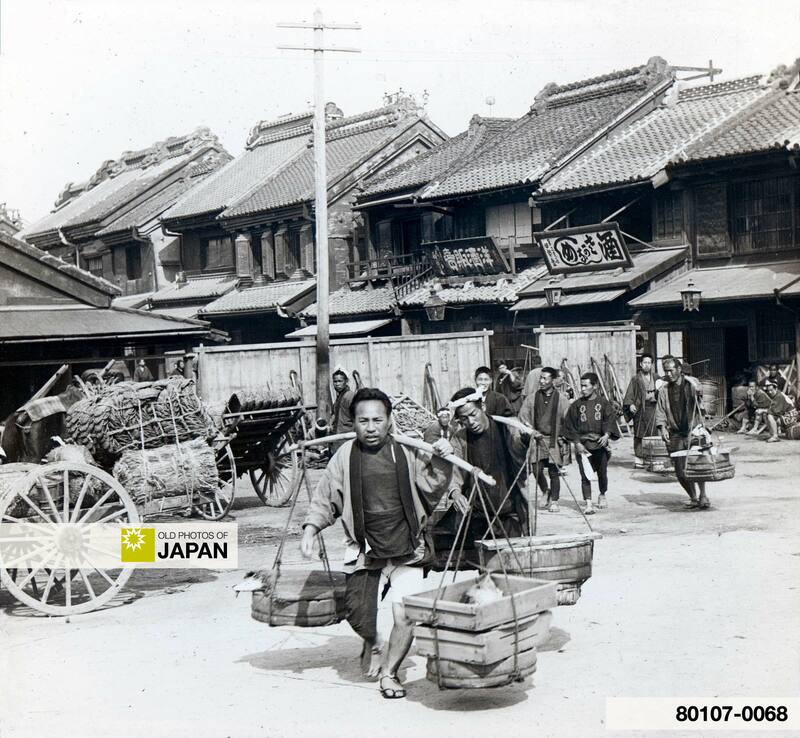 80107-0068 – Men carry buckets with fish at the Nihonbashi fish market, ca 1920s. It all sounds romantic and nice, but it was a tough life. Fish prices were decided behind closed doors by a few powerful people in the market. This was done in the afternoon after the market closed, so vendors and brokers wouldn’t know what prices they’d have to pay until they’d sold their wares. Prices were far from fair. Vendors and brokers really had to know their business to keep their heads above water. As Japan started to modernize in the second half of the 19th century, free competition would replace this system and the fish market at Nihonbashi slowly began to loose its important function. Then the Great Kanto Earthquake of 1923 completely destroyed the barely surviving 300 year old market. It was moved to Tsukiji, nearby Ginza. A modern market was completed here in 1935 and is still used today. This actually saved the market, as it was now organized on modern transparent trading principles. The bustling Tsukiji Market, officially called Tokyo Metropolitan Central Wholesale Market, is the largest wholesale fish and seafood market in the world. Although best known for its seafood, the market also sells vegetables, fruit, beef and poultry. It handles more than 400 different types of seafood and employs more than 60,000 people. Together with two other Tokyo wholesale markets Tsukiji Market handles an incredible 675,000 tons of marine products a year. But this market is soon coming to an end as well. 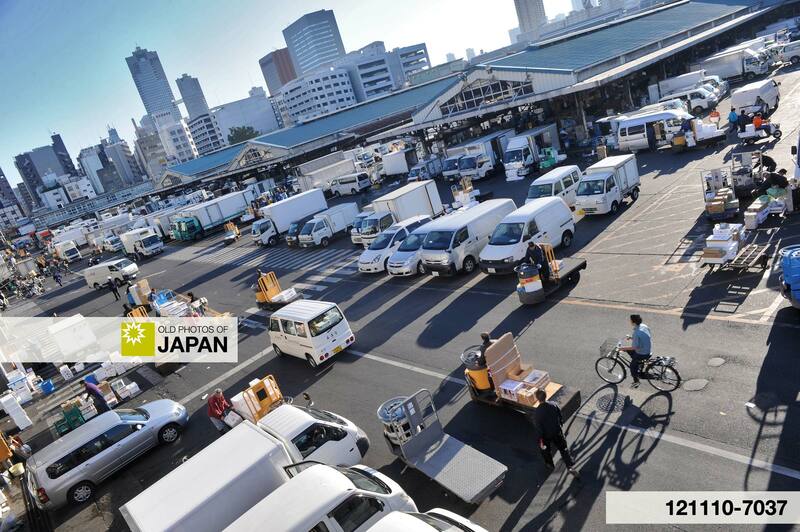 In 2015, the market will move to new facilities on reclaimed land in Tokyo Bay. After many postponements, the market finally moved to its new location on Sunday October 7, 2018. The new market in Toyosu opened on Thursday October 11, 2018. 121110-7037 – The fish market in Tsukiji, Tokyo. 1 Tomioka, Issei (July 7, 2008). The History of Nihonbashi Uogashi. Part 3: Fish Traveling to Edo. Kikkoman, 5. 2 Terry, T. Philip (1920). Terry’s Guide to the Japanese Empire Including Korea and Formosa. Houghton Mifflin Company, 147. 3 Tomioka, Issei (July 7, 2008). The History of Nihonbashi Uogashi. Part 3: Fish Traveling to Edo. Kikkoman, 9. You can also licence this image online: 100908-0008 @ MeijiShowa.com.